A stadium is a place or venue for outdoor sports with seats for spectators who come to watch the games. Stadiums are places of national importance as people from all castes, religions, etc. come together to support the national teams. 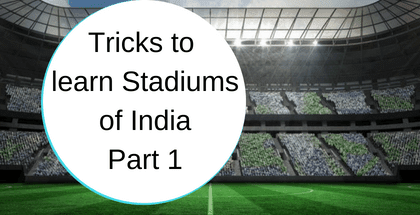 This article provides you with a list of Stadiums in India along with their locations which is a part of static GK asked in General Awareness of Exams. Below are the tricks to learn them effectively and quickly. Raja Shekhar ne apni beti Vishaka ko Mangalore main Raja Katappa se milwaya. Bhuvan ne Gaon ka lagan bharne ke liye Rs.1000 Indira se le kr Silky Mohan Ko diye. Rajinder Putra of Siwan and Moin Plays Cricket in Patna of Bihar. Veer Narayan Singh ki Rai (advice) se Raj Anand ne Hockey khelna shuru kr diya. Vasco da Gama ne Tilak Maidan main Baba Sahed se Pen khareeda or Fast Marg se Shyam Prasad se milne Goa nikal gaye. Sardar Ahmed Patel Surat main Madhav se mile or Rajkot gaye. Saurabh Rajkot se IPL dekhne moti Bagh Baroda gaya. Devil ne Guru Mahabir ki coaching mein Rohit or Bansi ko hisar mein hui kushti main hara diya. Dharam Plays Cricket on his HP Laptop. Gurbaksh and Sridhar are known as Sher of Kashmir in army.